The factory hitch sits almost flush with bottom of floor and then the plastic back "bumper" type cladding comes down a few inches. Problem I'm trying to solve is how to mount the round 7 blade plug bracket to the frame and get it down below the plastic outer skin. Any one already been there and done that? Only thing I have come up with so far is to run a foot or so of some square tube or channel along the rear frame that gets screwed to frame on top and 7 blade plug gets screwed to bottom. Ideally the channel or square tube would provide enough spacer to just get the plug bracket below cladding. Looking for any other ideas or suggestions, including those on how I might do what I'm already considering better. I can't exactly visualize your problem, but from your description, it sounds like you could run into problems with your plug being too low to the ground if you try to set it up below the bumper cladding. We had that problem with our old 98 Land Cruiser, whenever we took it off road and went through dips and gullies (not with the trailer attached). After ripping off a couple of plugs, I decided to drill a hole in the plastic bumper so that I could mount the plug behind the bumper with the face on the outside. Not sure if this helps with your question. I just went through this with my Mazda, and have mounted the 7-pin plug bracket onto the left side of the draw bar receiver. Zip tied through the holes on the plug bracket and around the square receiver tubing, then added two more zip ties around the tubing and plug. There was just enough of a gap between the car body and hitch draw bar receiver in two places to thread the zip ties thru, and it was behind the hitch pin hole. I use a locking hitch pin, safety chains and the breakaway switch, and I was able to cinch up the plug so there is no interference of any of these. I have to say I had a lot more options when I wired up my old Toyota! I'm happy to take and post a photo if you'd like. Roger, how about a pic of your hitch/tug. I looked on Etrailer of a DT after market hitch and it had a piece of flat bar to the left of the receiver for plug mounting and it wasn't any lower than the receiver. No idea of what your factory hitch looks like, could it come through the bumper cover? Just FYI, the company I retired from used Fords. On the Rangers that needed to be used for towing, one of the two license plate lights were removed and replaced with a round 6 pin plug. Easy to use and plenty of clearance from the ball. My Ranger is set up the same but the 7 & 4 are to the side of the receiver. I'll try to get a picture but yes the hitch comes right through the plastic cladding. Old Escape had an after market hitch that came out under the cladding and the plug was attached to the tubular frame with large hose clamps. 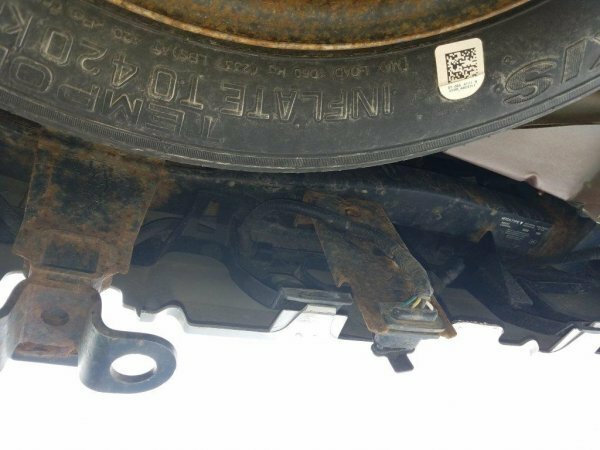 This Escape the hitch is the 1 1/4 receiver and the tube is flat flush with the underside of the vehicle floor. Then exits through the cladding. With the existing 4 pin light connector sliding into a notch in a metal plate. Also coming through the cladding. Escape doesn't really have a rear bumper. Just a plastic wrapper that comes down like a skirt. Rear does sit pretty high so I'm not really worried about ground clearance. Trailer would have issue well before rear of vehicle. Dear wife would not be amused if I went 2 tracking with this, not really the right vehicle for it anyway. I used a square "U" bolt and a flat piece of steel attached to the factory hitch just outside of the place where the 4-plug would have been attached.I cut the bumper cover to accommodate the plug as shown below. The cut out was done following the same instructions as Ford supplied for the factory receiver. 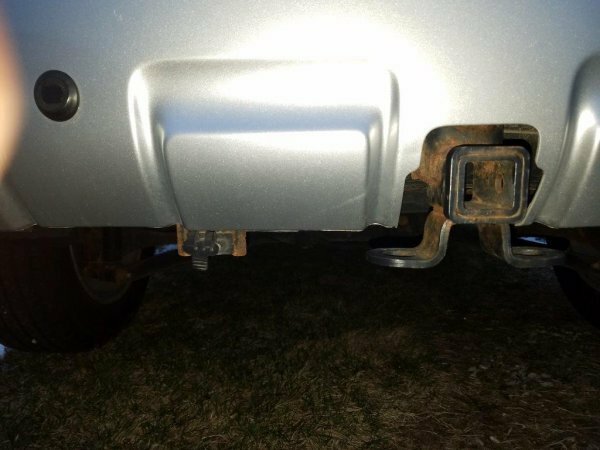 On my First Escape with an aftermarket hitch, I welded a bracket above the receiver and cut out the bumper cover. It worked very well too. You don't say which Escape you have but on the 2014+ the factory hitch actually replaces the stock bumper using the same plastic cover. On my TC it required removal of the bumper cover and bumper, then replacing the rear bumper with the hitch attached with 10 bolts, then reinstalling the stock cover. I struggled with mounting the 7 blade connector on my 2011 Ford Escape as well. Problem is that the plastic bumper cover extends at least 6 inches down from the horizontal square frame tubing that it covers. I mounted a 2x6 or 2x8 L bracket to the bottom of the tubing, then I cut and fastened a piece of brown plastic decking to the L bracket. The brown plastic decking extends about 3 inches below the bottom of the bumber cover and I drilled a hole in it just large enough to get the 7 blade connector through. I could have attached a 7 blade bracket to the L bracket, but chose to make the plastic one instead. It is sturdy. The hitch is factory equipment. This is the 2012 but much the same issue as John in Michigan with his 2011. Here are a couple of pictures. From underneath a solution presents itself. What I'm going to do is unclip the existing 4 pin and screw an angle bracket across the existing vertical bracket to provide a horizontal lip to screw up into. The 7 blade plug I have is intended to take the existing 4 pin as a plug in so that should be fine. Assuming I can clean the existing plug well enough to maintain a good connection. I would think that the attached piece that comes down from the receiver tube is a stock part. This vehicle has a factory tow kit installed. The part might be an option for others who have similar issue with mount point several inches above bottom edge of cladding. Wife would NOT be happy with me if I started cutting on the car. My old commutemobile sure but the nice car not worth my life to get a rotozip out there. It has been snowing so getting underneath far enough to look back at bumper was a bit of a pita. The one ford dealer didn't provide any information. Said they don't know how the tow package is installed unless I brought it in for service and have no information on parts. You might have to insist. Me I'm not going back there for any service. Second thing is I need that temp spare pulled, the fittings greased and the air pressure checked! Wouldn't do me much good if I had a flat and was unable to get the rusted connections loose. PS it looks like I could use a little paint down there too! Roger looking at your picture I would say that is what I did, I used the bracket that was already there for the four pin connector and bolted a seven pin bracket on to it. But of course I made my seven pin bracket. Looking at the pic from underneath it looks like there is the perfect spot in the bumper cover to flush mount the 7 pin. If it we're my vehicle I would cut a hole and flush mount it on the bumper cover. Should look like a nice clean install. take another look at my old Escape (the gray one above) The cut out was made with a razor knife. It looks like it could be factory. Have no fear, heck I have cut sun roofs into several of my new vehicles the day we brought them home. how do you guys come up with these ideas really neat? as for a sun roof what a worthless thing on a car I have one on my 2005 Cadillac and have never opened it! how do you cut into that plastic like that also? but for some reason it has automatic back and side window covers I have never used either I am trying to figure out if it must have been an uber car in its early life!